If you have information about a missing person, call the National Missing Persons Hotline on 0500 700 700. 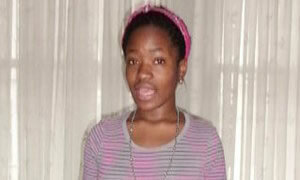 Police are appealing for assistance to help find a missing twelve year old from Fulham. Madeline Weto-Kala, aged 12, was last seen by her family at her home address in Fulham at 2pm on Saturday 28th May. Madeline's mother gave her permission to go to the Putney Odeon with a friend. It is understood she never met her friend. Madeline (pictured below) is described as a black female, slim build, 5ft 5" tall, brown eyes and black hair with extensions. It is believed she was wearing a white jumper with black horizontal lines, black belt, black leggings and brown boots below her knee and wore two chains both silver and one with the letter 'M' when she went missing.